BEREAVEMENT MASSAGE: Using massage as a coping mechanism for the grieving process pre and post death of a loved one. Bereavement massage seeks to mechanically stimulate the parasympathetic nervous system, the "rest and restore" response that occurs once a perceived threat is past. When muscles relax and anti-stress hormones are released, the body can re-balance itself. It has been documented that massage help decrease stress and depression, two symptoms very common with grief and bereavement. Three massage sessions during a 12-day period can create harmony between our body, mind and soul, through calming and nurturing the neurological system of the body, hence, having bereavement massage, is beneficial to a host of people suffering a loss of a baby or child, loss of a job, retrenchment, failed IVF treatment or early or late miscarriage and a host of other situations i.e. parent’s death or diagnosis of terminal sickness etc. Further massage done correctly can assist the body to maintain this shift, balancing the person further as they process all the feeling and health response to the situation their body is dealing with. When a family member, friend or loved one passes away, varying degrees of emotional and physical pressure can weigh down on the human body. Mental and emotional fatigue can take days, weeks or even years to conclude as we each process and deal with emotions and thoughts differently and at different times. To help release some of these common pressures associated with mourning and lift any burden that you might be carrying around, it may be helpful to use massage as a healthy mental, physical and spiritual outlet during your grieving process. Massage Therapy can provide relief from stress and physical tension, Massage is known to be able to assist in alleviating headaches and body aches and pains which occur during the grieving process. Receiving Massage whilst mourning can provide comfort and nurturing. It can also allow someone to have some well-needed quiet time away from the situation. Plus, it can also help them to relax and encourage much needed sleep. Reasons for receiving bereavement massage? Massage mentally allows you to totally ‘switch-off’ giving you time to bring new thoughts into your mind. The grieving process can include different stages for everyone that can happen at various times after you’ve lost a loved one. However, no two people will grieve in the same ways, for the same time frame. The process is individual and should be approached in a manner that you’re comfortable with and that meets your specific needs. As you face the emotional and physical challenges that are involved in the process, it’s important to remember to take one step at a time and to not keep feelings bottled up inside. Keeping your feelings inside isn’t usually good for the body, mind or spirit, it causes imbalance and eventually disease of the body’s functions. There isn’t one right or wrong way to mourn, so everyone should be allowed to grieve on their own terms. As a therapist, I try to always respect and honor my clients’ grieving process. I try to be supportive, comforting and just be present for each person in that particular moment. Surrounding yourself with loving and compassionate friends or family members may be helpful for sharing your feelings when you’re ready to connect. Or, if you don’t prefer to express yourself by talking, then writing in a journal can sometimes be a powerful and freeing tool. Finding a quiet place where you can meditate, pray or be still also can help soothe the spirit, as well as seeking the calmness of nature to clear your mind and release your emotions may be helpful, or for some crying and screaming out loud, listening to loud music, one never knows what or how one is going to respond until one is faced with the moment when grief feels so overwhelming and needs to be released. In addition to the emotional fatigue and pain that is common for someone who is mourning, physical conditions such as headaches, body and joint aches, and insomnia also can be present during the grieving process. Releasing physical pain and tension with massage can not only help your body feel better, it can also be beneficial for improving your mental state, as specific types of massage assist in releasing positive endorphins if done correctly. When your body isn’t in pain and you feel better physically, your mental outlook on life can in turn lead toward a more positive nature. Mental and physical health go hand-in-hand throughout your daily life but, it’s important to focus on both during the grieving process. The two can feed off each other negatively if both aren’t addressed, or they both can work together to promote healing and rejuvenation. The power of massage can be a powerful tool for helping bring together a more harmonious state of mental and physical health. As you embark on the journey of healing a hurting heart, regular massage therapy sessions that focus on nurturing your mind, body and spirit can lead to powerful results. Combinational massage sessions, using different techniques and modalities for example one that combines a mix of relaxing Swedish strokes with some lighter level deep tissue massage technique works to not only soothe the mind and body, but also pulls out any heavy energy that you may be carrying around and to put forth a more peaceful and compassionate energy. As time progresses it may be appropriate to add in some deeper work, stretching and mobilization techniques to open up blocked energy areas and alleviate more of the physical manifestations that may be present during your grieving process. I believe massage provides a wonderful way to receive comfort and nurturing in a non-judgmental way, which allows the body to process feelings and emotions and helps one to move through the 7 paths of grieving, which really do occur. Not long ago, in the early 1980's, David Palmer (founder of the Touch-Pro Institute) considered ways to make massage more acceptable to the general public. As both a practitioner and teacher of chair massage as well as traditional Japanese massage; he formulated a combination of deep tissue, acupressure, stretching and percussion techniques. Having people remain clothed during massage overcame the first obstacle. Then, in 1986 he invented the portable massage chair for it to become more conveniently available. With this mobility of the chair, he could bring massage to the people, anywhere, anytime; and the term On Site Chair Massage was born. 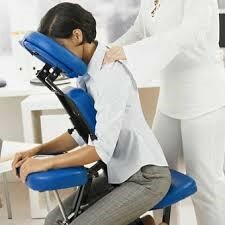 Clients have been pleasantly surprised by how satisfying the chair massage experience can be. With the variety of techniques and sequences used, you will experience great satisfaction with this short invigorating massage.